This is a flap-front purse in a simple mosaic pattern using variegated yarn to give the illusion of complex colour work. 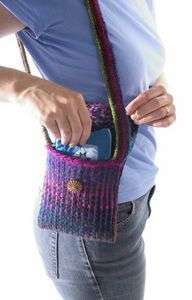 The firm fabric of mosaic knitting, combined with a tighter gauge, results in a bag that won’t sag! Finished size is 8 inches (20cm) wide and 6 inches (15 cm) high. Bring yarn to front of work, going between the needles. Slip next stitch purlwise, return yarn to back of work. Leave yarn hanging for now. Slip next stitch purlwise, and lift first slipped st over it and off the needle. Continue in this fashion, binding off a total of 6 sts. Slip last st from right needle to left needle and turn. Turn work. Slip first stitch to right needle and pass “extra” cast on stitch over it and off the needle. Continue row in pattern. »Row 1: With Ball A, work [k2, sl 1] 16 times across row. »Row 2: With Ball A, work [sl 1, p2] 16 times across row. »Row 3: Drop Ball A, join Ball B. Work [k1, sl1, k1] 16 times across row. »Row 4: With Ball B, work [p1, sl1, p1] 16 times across row. »Rep Rows 1-4 for pattern until piece measures 16 inches (42.5 cm) from CO row. »Next Row: Work buttonhole as follows: work in pattern over 21 sts, work one-row buttonhole over 6 sts (as described above), complete row in pattern. »Continue in pattern for 1 more inch (2.5 cm). »Row 1: With Ball A, work [k2, sl 1] 6 times across row. »Row 2: With Ball A, work [sl 1, p2] 6 times across row. »Row 3: Drop Ball A, join Ball B. Work [k1, sl1, k1] 6 times across row. »Row 4: With Ball B, work [p1, sl1, p1] 6 times across row. »Rep Rows 1-4 for pattern until piece measures 28 inches (70cm) from CO row. »Bind off. **Alternatively, you can cast on 150 stitches and knit garter stitch for 7 rows. Bind off. »The long edges of the strap will curl toward the back and meet in the center, forming a double thickness. This helps give the strap strength and resistance to stretching. Using the yarn needle, whipstitch the two long curled-over edges together along the back of the strap to secure. »Fold main piece, right sides together, so that 12” (30cm) of the total length composes the bag and 5” (12.5 cm) is left free for the flap. With yarn needle and length of yarn, whipstitch the sides together. Turn to right side. Sew strap firmly to sides of bag. Using a sewing needle and thread, attach button to front of bag, lining it up with the buttonhole on the flap. Block as needed. Voila! About the author: Amy Polcyn is (almost!) a TKGA Master Knitter who enjoys designing and knitting more projects than she has time for. She especially loves working with color, including complex Fair Isle designs. When not knitting, she is mom to 5 year–old Emma and an elementary school teacher. Originally published in the now defunct Spun Magazine.